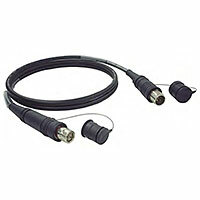 Canare FCC Series HFO SMPTE Hybrid Fiber Optic camera cables are designed for studio and broadcast applications. Canare HFO assemblies meet the most demanding applications for HD uncompressed video transmission over short or long distances. All Canare standard FCC Series HFO cables are made with cost effective Canare LF-2SM9M 9.2MM cable, with abrasion-resistant jacket. Canare HFO Connectors used, offer easy maintenance with detachable alignment sleeve and insulator. The FCFA and FCMA connectors feature famous Canare quality, with stainless steel body, and color rings included.